In August I switched to Franklin Covey Classic size with a variety of inserts and settled on 2PPW using FC's 5 Choices layout (those pages are spiral-bound, so I removed them from the spiral and punched them for my binder). 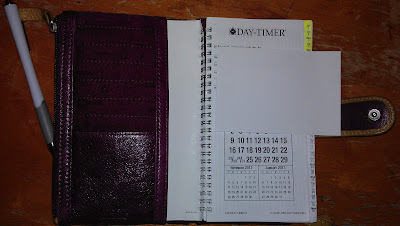 I was using it with DayTimer's 1PPD, but the whole thing became too big and heavy to easily carry around. I don't mind having the weekly pages (where I keep all my appointments and weekly to-do's) sit in one spot near my desk, but I need my daily pages constantly accessible. 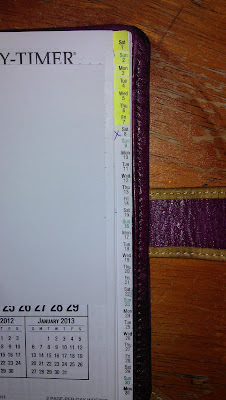 I want something that allows me to keep track of my schedule for the day, plus have enough room to make lists and do a little journaling. I also want to carry a variety of writing implements. I wanted it small enough that I can throw it in my purse, have it open on the seat next to me in the car, and just, overall, be easily accessible wherever I am. So this is what I came up with with. DayTimer 2PPD - tabbed - and a Fossil wallet I had on hand and wasn't using (Fossil wallets are my favorite; good organzitions, great colors, and buttery-soft leather). I don't pay attention to the headings dividing the pages, I just write whatever I want wherever I want, with the exception of the timed slots. I often fill up the pages completely. In the pic below I pulled the booklet out a bit so you can see how it slides in. 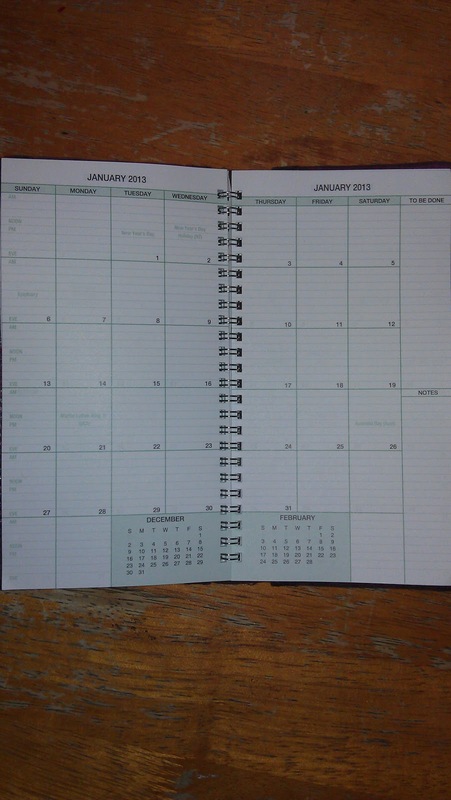 The booklets encompass one month with five months of 2PPM in the back (which I don't use). 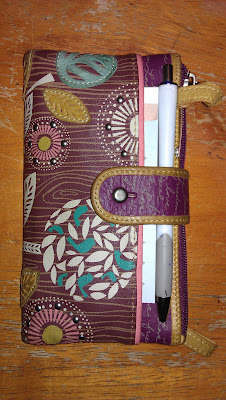 I don't use this as a wallet because I've tried combining planners and wallets before and I don't like it. 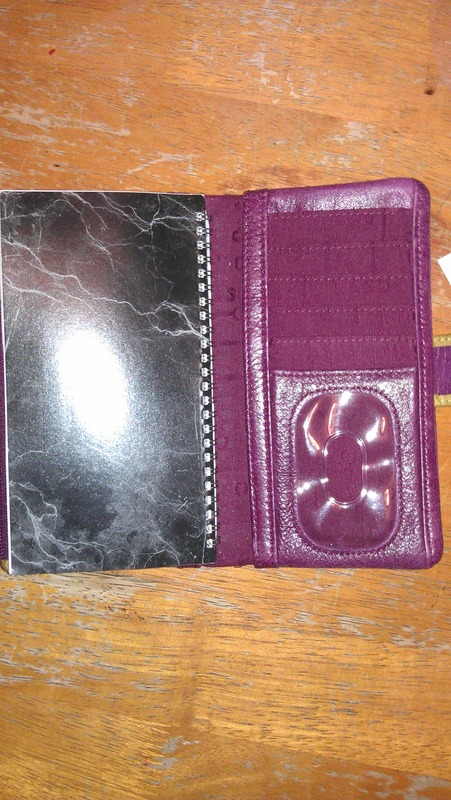 Wallets feel 'dirty' to me - they are everywhere, sitting on counters at various establishments. 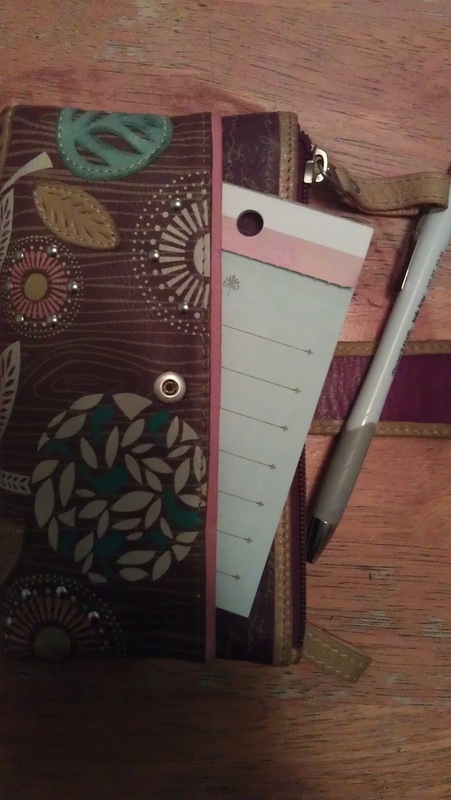 Also, this planner floats around the house - next to my bed, on the dining table, by the couch, etc., and I want my wallet to ALWAYS be in my purse so I know it will be with me if I have to rush out the door. This wallet is so feature-rich that I have a compartment on the back that goes unused. 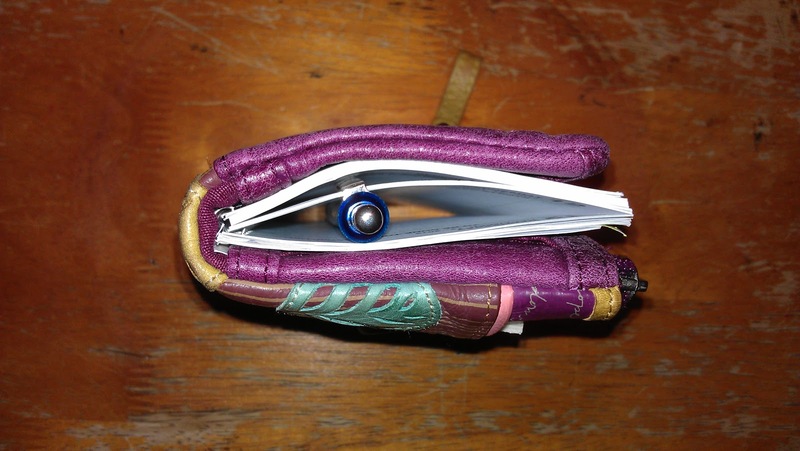 Sometimes I attach my pen to the current page and snap the wallet closed. 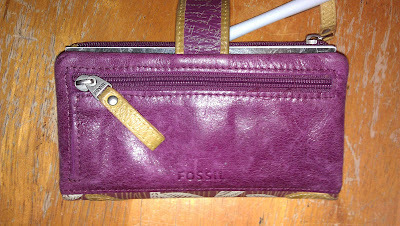 Sometimes I hang it by the loop attached to the front zipper. 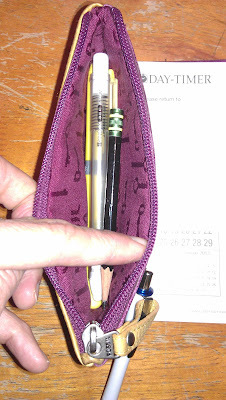 Sometimes it goes into the pocket with the other pens/pencils/highlighters/erasers. That's it, lovies! Good luck to ALL of us as we go round and round like a dog settling into its bed, looking for the comfortable feeling of the perfect planning set-up for 2013! I am on the same planner merry-go-round, but I'm pretty happy where I am right now. 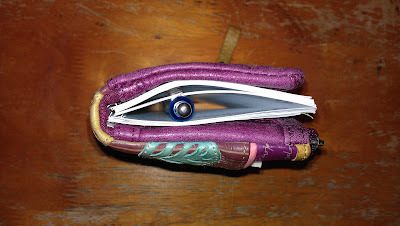 I always need a wallet or other cover on my planner, though. That's why this post spoke to me. Thanks for dropping in! What is your current set-up? Reply if you have the time and inclination. This is really nice! Can you put a link to the Daytimer product you've used in a comment please? I'd like to have a better look at it. Thanks! Copy/paste into browser if need be. Still loving it! Good luck. A very very late response, but I just almost bought that exact DayTimer setup... I find their stuff so appealing. But then, last minute, changed my mind and ordered a franklin 2PPD in compact size and a cheap used franklin quest binder (green leather!) off ebay. 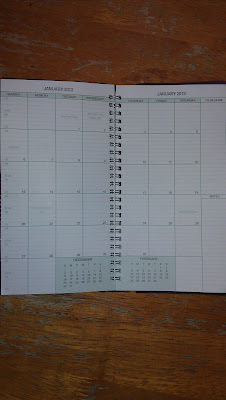 I plan to use this strictly as a work planner, leave it and the unused/archived pages (I bought one of the storage binders too) in my desk. I've always been loyal to the one-life, one-planner philosophy but recently realized that there may be advantages to keeping these functions separate. Hey, Josh, nice to hear from you! I'm using a different set-up now, it's called Google Calendar, haha! 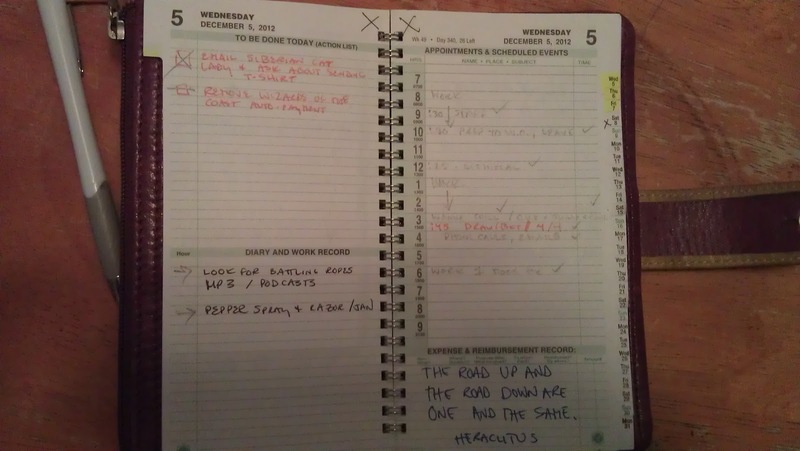 For some reason, an electronic calendar finally clicked for me. I think using the different colors for different calendars (I have twelve!) made it work for me, plus I always have my phone (Calengoo for Android), and having an iPad (utilizing Calendar+, the native iPad app was horrendous in syncing) is really convenient for sitting at a cafe and doing my planning. I'm going to post my FC and FF binders on EBay asap. Will post a notice here when I do. I really love my binders but I hate to let them sit, unused, in the garage. what size fossil wallet are you using?